My friend Sarah and I went for a nice nature walk in Sebastopol this past Friday, which was appropriate considering our restaurant choice. I had been to Backyard in Forestville four or so times before, and I was so excited to go to again. Backyard is a farm-to-table-style restaurant and by definition features much of the produce and meat grown and raised (or caught, in fish’s case) in Sonoma County, including from my roommate’s farm, The Giving Gardens Project (website coming soon). The chef at Backyard is a master of flavors. Everything I have eaten there is absolutely delicious. Some of my favorite items are their polenta, whatever pork dish they have on hand, and the flat breads. 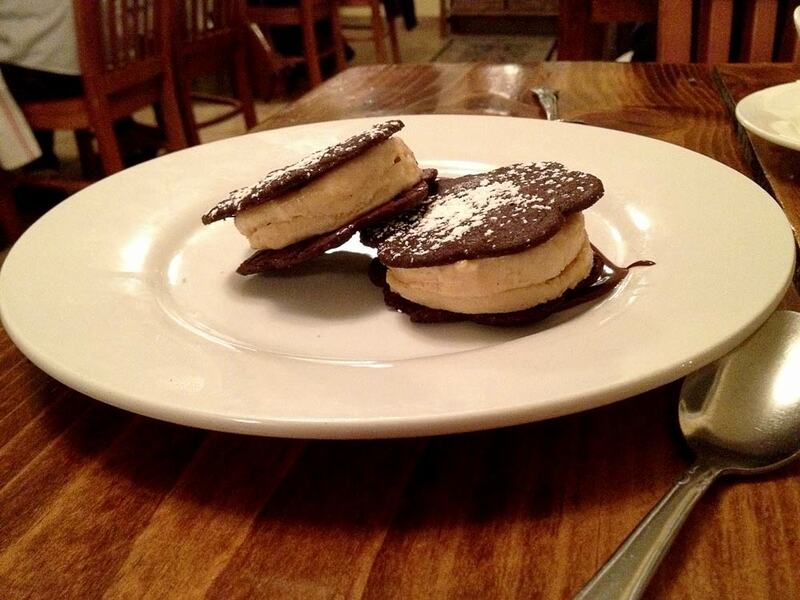 Because Backyard relies on the local farms, the menu is always changing. One week they could have cod, and the next week they might have halibut. However, it doesn’t matter what’s on the menu that week because the chef always manages to excite my taste buds. A bonus to living in Sonoma County is definitely all of the great local wine, but this area also used to be the home of many more apple trees. Some apple orchards still exist today. One of the most popular apples in the area, the Gravenstein, is great for making juices and ciders. We were lucky enough to be able to try some of the locally-brewed cider, specifically from Devoto Orchards. The flavor was just to my liking: not too sweet and not too sour; just right. 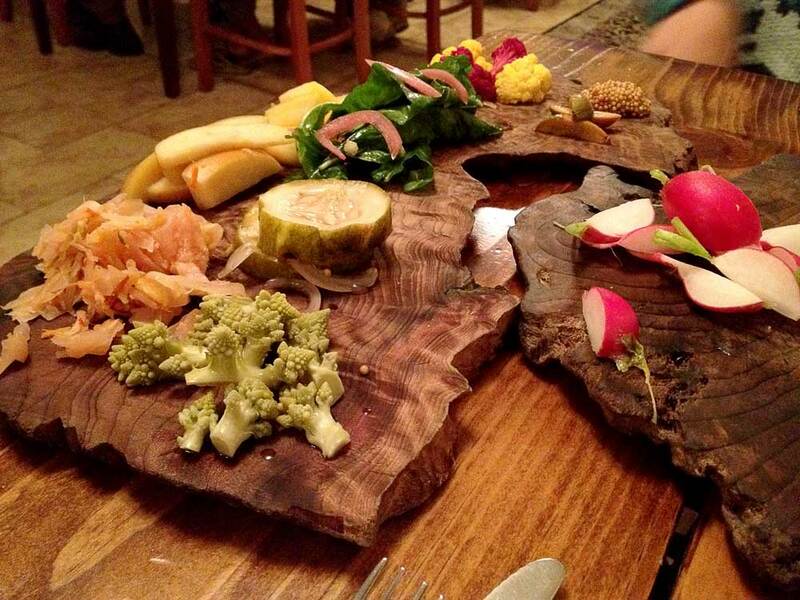 One of the first dishes we shared was the house pickle plate featuring locally-grown produce pickled to perfection. It gets more specific than that (as for the variety of pear/melon/cauliflower/etc), but I can only remember so much. I love pickled anything, so for me, this dish was tasty, tasty. If you like pickles and happen to eat at Backyard when they have something like this, definitely order it! I’d say my favorite was probably the kimchi. Oh, man. If you love radishes and blue cheese, this is definitely something worth trying. The fermented butter is like a much creamier and fluffier blue cheese. This dish is so simple, yet so amazing. 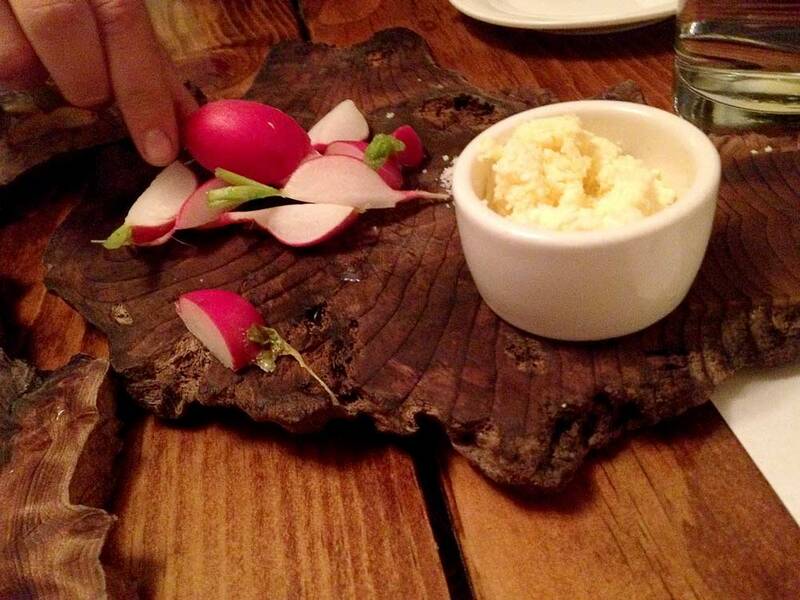 Just dip the radish into some fermented butter, dip in the sea salt (it’s hiding behind the butter dish), and enjoy. It’s a perfect blend of flavors. 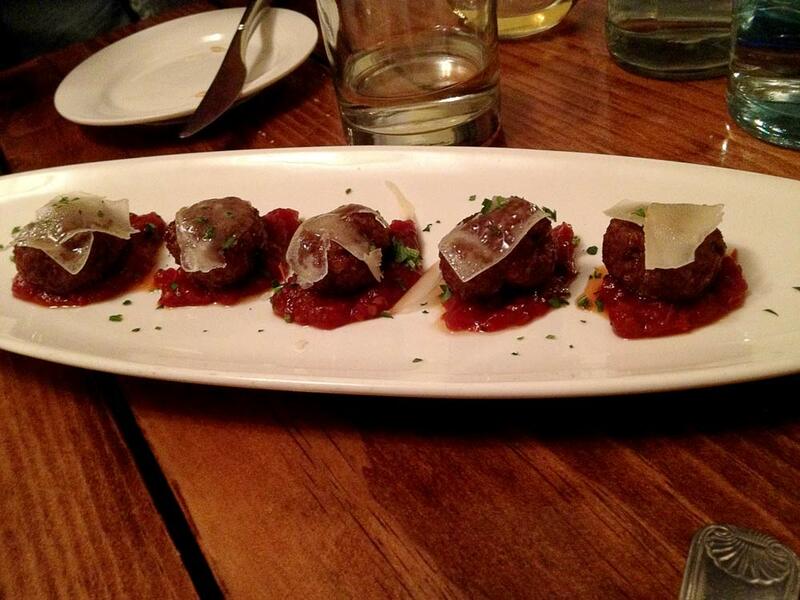 I knew as soon as I saw “lamb” and “meatball” in the same menu item that I wanted it. And I was not disappointed. The meatballs and cheese were a perfect mix of salty and savory, and the tomato jam just brought the perfect amount of sweetness. Would order again! 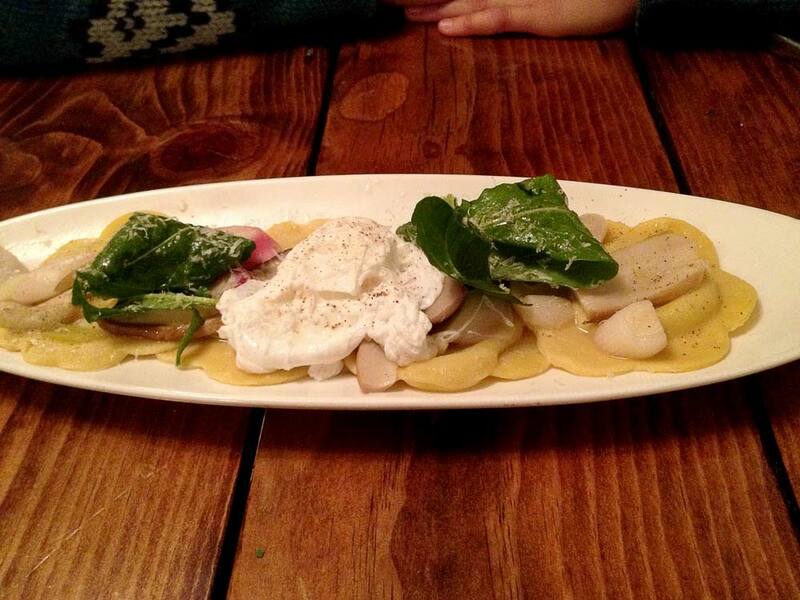 Sarah ordered the porcini mushroom ravioli, which was a great choice! And she was nice enough to let me taste. The filling was a little thin, but delicious, and the pasta tasted so fresh and homemade. This was definitely some of the best pasta I’ve ever eaten. I ordered the Lamb Moussaka, even though I had no idea what moussaka was at the time. When the server explained it to me, it sounded perfect! Moussaka is a bit like a shepherds pie casserole which always has eggplant and/or potato. This moussaka included ground lamb and both key ingredients as well as cheese. It was absolutely divine, and I’m so happy I got to taste it. 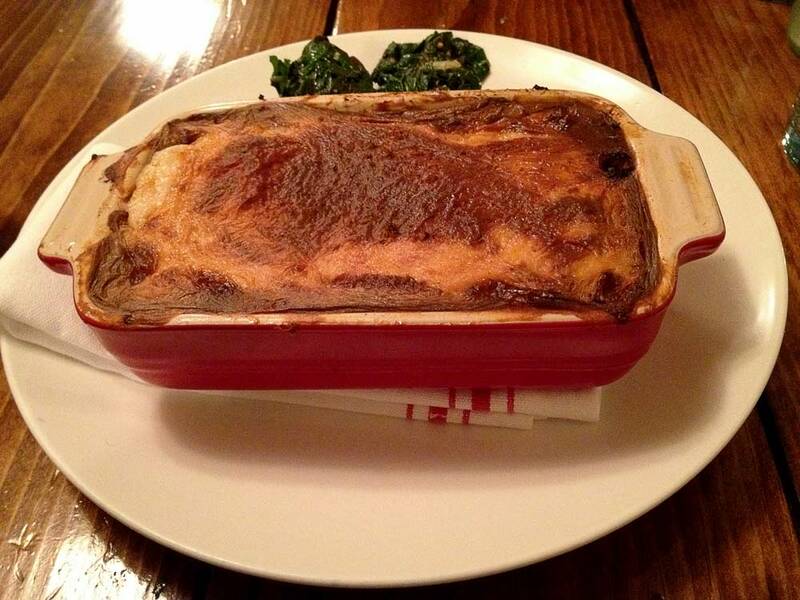 The moussaka also came with braised greens which were yummy and perfectly seasoned. I forgot to take a picture of the dessert menu, so for the next few items, I will be describing from memory. 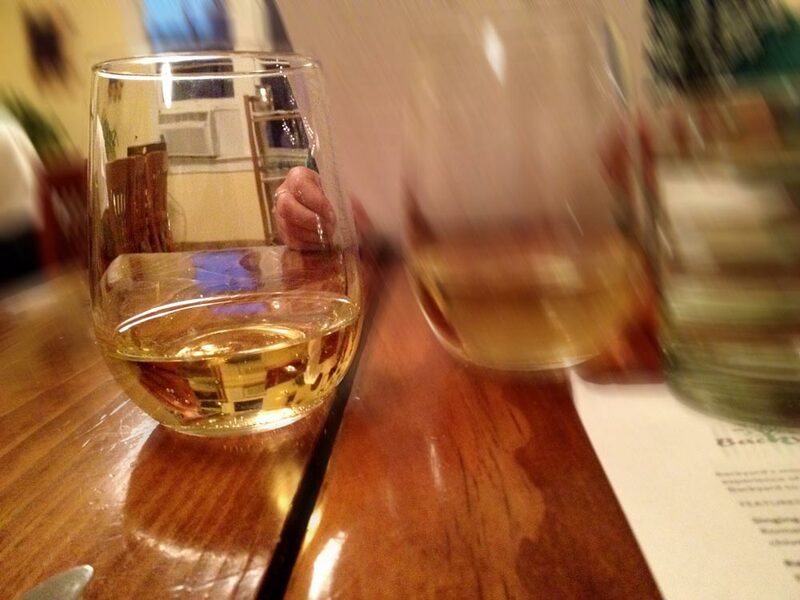 We were surprised with a complimentary dessert wine, and I forget which kind it was. 😦 I am also not at all familiar with dessert wine so take these next few sentences with a grain of salt. 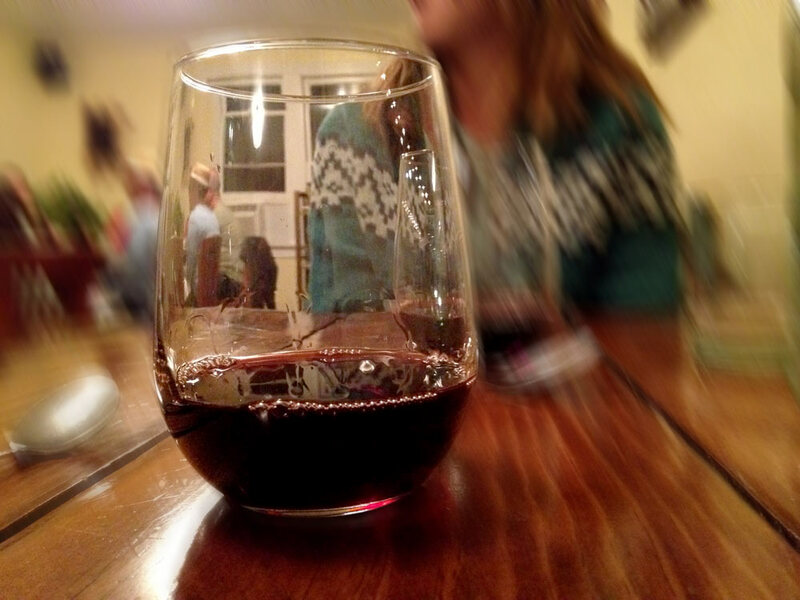 It was absolutely delightful, and while it tasted sweet plain, it tasted nice and tart after taking a bite of dessert, which I imagine is the whole point of dessert wines. I am a huge fan of salted caramel, which was included in the chocolate budino, so I had absolutely no choice but to order it. (Okay, I had a choice… I just took the less-healthy-but-tasty path). And I definitely made the right choice. 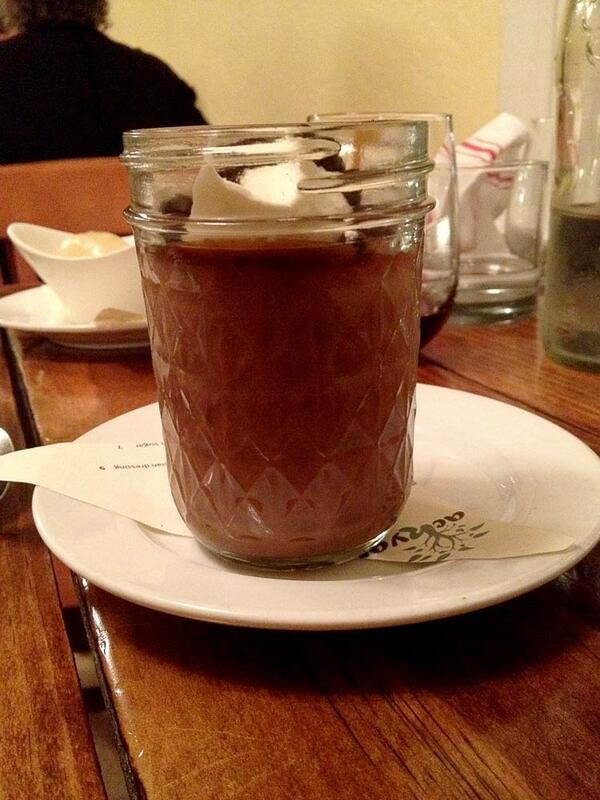 My goodness, it is so incredibly sweet, but so chocolatey and salty and creamy and… oh, it was just so good! Please order any custard or pudding-like dessert if you eat here! And sorry, not the best picture! I realized that after we had eaten it all! 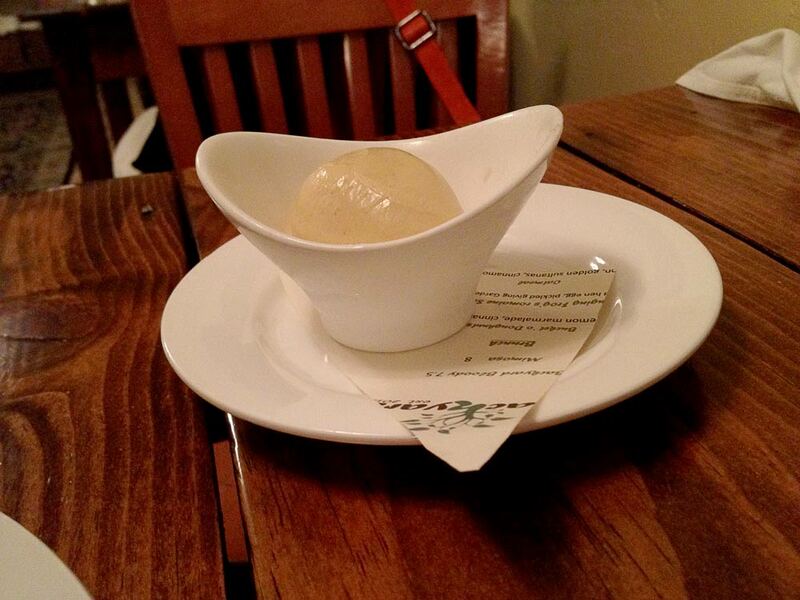 And the last dessert item we had that night was the candy cap mushroom ice cream. If you’ve never had candy cap mushrooms before, they definitely live up to their name. The flavor reminds me a bit of maple syrup. And the ice cream, as usual, was awesome. Please, please, please give Backyard your support! They are doing a lot of right in the world by only (or mostly?) using local ingredients, and the food is delicious to boot. And for the type of restaurant it is, I believe it is fairly priced. And they just received a Michelin Bib Gourmand award, which is incredible for a fairly new restaurant!